Many homeowners want to know about the terrazzo restoration process and whether their terrazzo floor can be restored, especially if they need terrazzo pad damage and stain removal. Let’s start from the beginning. When I go into a house, for a pre-inspection, I look for what stains are present, what damage has been done in the past and the quality of the original installation. We’ll start with these three things and expand on them. Many stains are removed from terrazzo during restoration. We usually pre-treat heavily stained areas, before we start the job. One great tool for removing stains in terrazzo is an industrial strength hydrogen peroxide. We can put this product down days in advance to help lighten a stain. After grinding we treat the stain between grits. The goal is to keep the floor wet with a bleaching agent all day and overnight again. On a four day job we will treat the floor every night until the stains are gone. Other stains can come from glue, used to hold down carpet padding. Glue on terrazzo floors can present big problems for companies that use a buffer to restore the terrazzo. Buffers do not have enough down force to remove most pad glue from terrazzo. Even the old non-planetary grinders that weigh eight hundred pounds can have problems removing glue. We use a planetary grinder that weighs around four hundred pound and is very aggressive on glue stains. We have a ninety-nine percent success rate with pad glue. 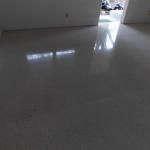 If your terrazzo floor was already restored, by another company, and still has glue stains we can likely remove them. Another type of stain that is harder to remove is staining from old waffle padding. 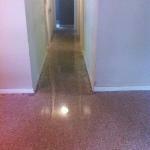 No other problem damaged more terrazzo floors then these carpet pads did. If the goal is to completely remove these stains then maybe the best option should be to cover the floor. That being said we have had a lot of success making these floors look great. 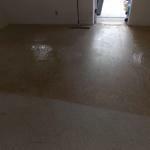 These pictures show a floor done at the end of 2013. 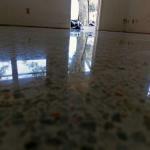 Other companies turned this job down, but when we were finished the owner loved his floor. 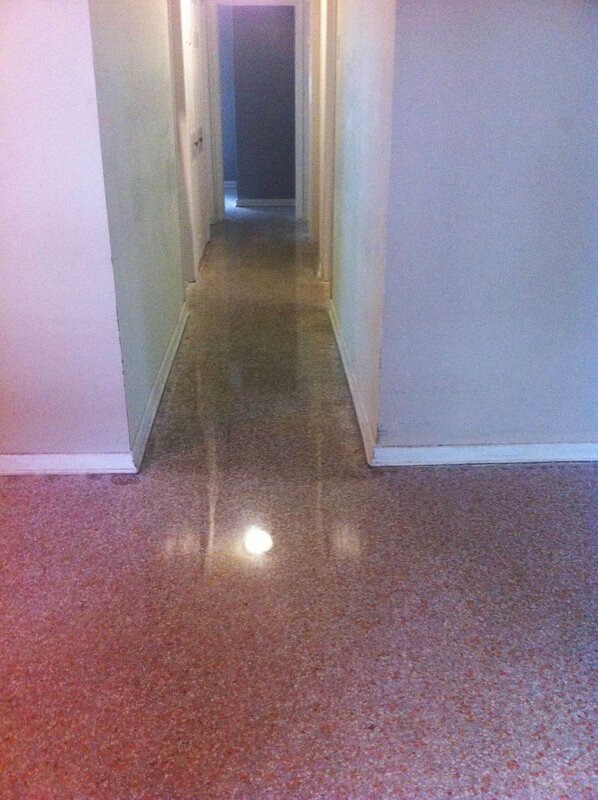 Check out our page dedicated to terrazzo with pad damage. It shows more pictures. Most people who love terrazzo know the floor might not be perfect. We have restored many floors with pad damage and had very happy home owners, though some staining remained. One thing that helps cover this problem is a very shiny floor. When you get a lot of reflection, the floor looks so busy that these stains are not so noticeable. Another type of stain can come from vinyl or ceramic tile. The stains in vinyl and ceramic tile are often in a grid pattern. 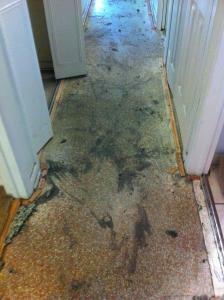 This can be from cleaning the floor and having water and dirt travel to the terrazzo floor. It can, in extreme cases, be orange or yellow. These stains need dealt with. We have gotten these stains up when they were very dark. If you simply try to grind and polish them out you will fail. These stains need treated over the course of the restoration, if not in advance of starting the job.